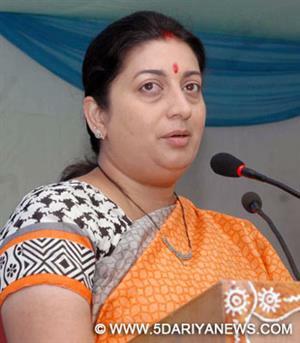 The Narendra Modi government is keen to promote Hindi globally, Human Resource Development Minister Smriti Irani said Thursday.She made the comments after laying the foundation stone of an international auditorium at the Central Hindi Institute (CHI) here.Irani told the media that the central government would open centres in a number of countries to promote Hindi. "Online teaching of Hindi will also be started soon," she said.She said interest in Hindi was increasing globally. Teachers from the CHI's Agra headquarters would be deputed to undertake teaching programmes abroad.